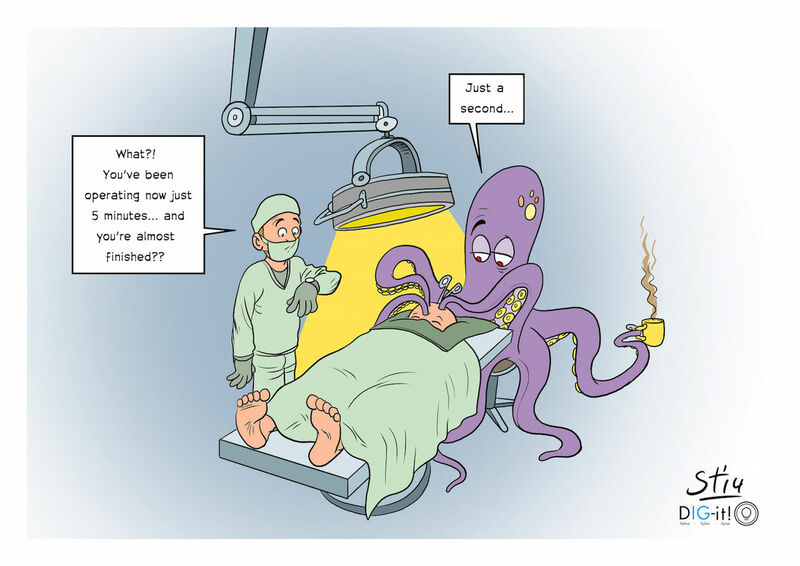 Inspired by muscular hydrostatic skeleton systems in squid tentacles a range of steerable medical instruments have been developed for nearly all applications of minimally invasive surgery, e.g. laparoscopy, neurosurgery, eye surgery and catheter interventions. Our novel prototypes feature world's thinnest and most manoeuvrable steerable constructions. For medical input we collaborate with medical specialists (AMC, LUMC, Erasmus MC, UMCU), and for biological input we collaborate with the University of Wageningen. Our researchers and instrument makers collaborate closely in a team, using a new design methodology that strongly stimulates creative design processes. Worldwide, our research group BITE is on the forefront. Commercialisation is being carried out by spin-off company DEAM in collaboration with the medical industry. The surgical instrumentation market is very complex and the "when" depends on many factors. But I expect that our inventions will revolutionise minimally invasive surgery and enable complex operations that can not yet be carried out.